house smells of delicious food, there are lots of new faces, and it’s time to practice their best begging face. 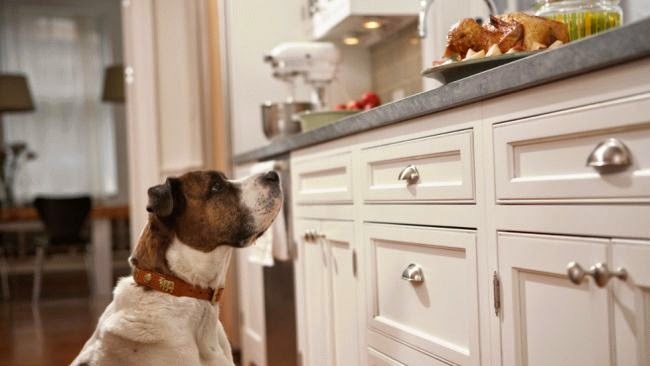 A full day of cooking means you’ll likely have some four-legged company in the kitchen. Uncooked food and herbs can cause your pet gastrointestinal upset, so keep an eye on food while prepping dinner. In particular, keep dogs away from raw dough, cake batter, uncooked eggs, raw meat, and herbs. If you do decide to give your pet a little bit of turkey, make sure it has no seasoning, skin, or bones and is well cooked. For a refresher on foods that can be harmful for your dog, check out a list on the ASPCA website. A little bit of food here and there can add up, causing stomach upset, vomiting, or in severe cases pancreatitis. Let your guests know that your pup shouldn’t be given any table scraps, so you can keep track of what and how much your dog has eaten. Your dog may look for other sources of food, like in the trash or traces of food on aluminum foil, wax paper, and plastic wrap. If ingested, these items could make your dog quite sick. Make sure garbage is secure and food coverings are kept out of reach. Have some down time for your pet. Thanksgiving can be a stressful and busy time for both people and pets. In the rush to get everything ready, don’t forget to take your dog out for its regular walks. The exercise will also help tire your dog out before company arrives. You can also set aside a stuffed Kong treat and special chew toys to keep your dog preoccupied while everyone is arriving. When guests are over, make sure you set aside a quiet space away from the crowd in case your pet needs a break. Your pet should have restricted access to exits, like the front door and garage, to prevent them from running out while people are entering and exiting. Just in case, your pet should be wearing its collar and ID at all times while company is over. Following these simple tips can help you and your pet get the most out of your Thanksgiving holiday! Soon we'll be posting some absolutely scrumptious Thanksgiving recipes that are pup-friendly, so keep an eye out for those!